We quite often by a full size Jamaica Ginger Cake to share as treat. I’m not the biggest fan of ginger but there is something about Jamaica Ginger Cake that works, possible that the ginger is so well balanced with a good dose of sweetness, and isn’t too sharp a flavour. 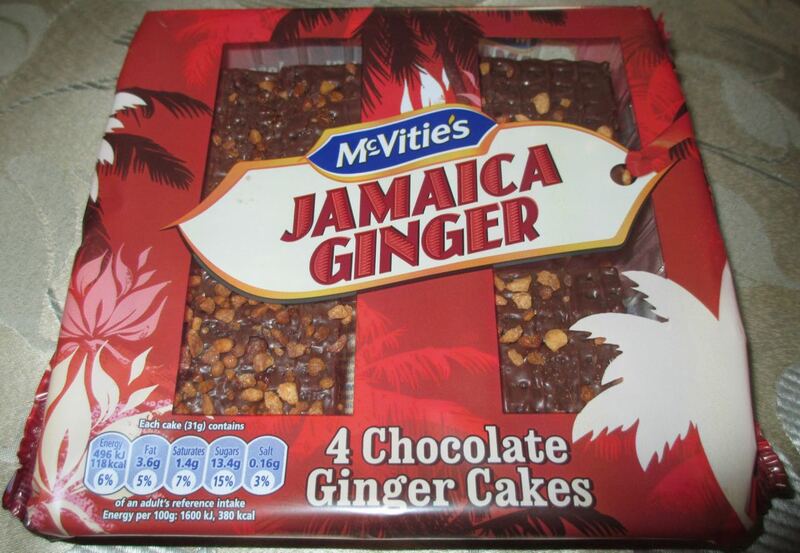 I was intrigued to see that McVities had introduced these new Individual Jamaica Ginger Cakes, which come in a four pack and are decorated with chocolate and a crunchy topping. The base part of the sponge is very similar to that of the proper cake; it is moist and sticky, with the heavy emphasis on a sweet ginger that isn’t too strong. The chocolate topping is a nice edition, it only has a mild sweet impact but it is nice. 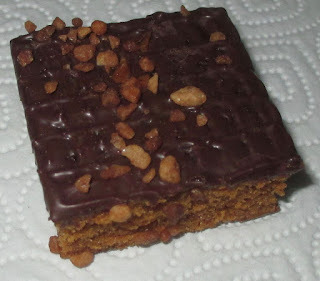 The crunchy topping isn’t very strongly flavoured, but it does add a nice mix to the texture too. For me the difficult part of a Jamaica Ginger Cake is the problem of cutting it, it is a so very moist and soft that it is difficult to cut into neat pieces, and these individual cakes solve that problem, they also look pretty with their smart topping and are much smarter to share with friends. They also work well with portion control as each piece only has 118 calories, so they are not too guilt inducing, but are still big enough to be a treat with a cup of coffee. I’m pleased that McVities have introduced these Individual Jamaica Ginger Cakes, it gives the Jamaica Ginger Cake a modern twist, but still manages to stay true to the original flavour.